About a year ago our family began raising backyard chickens. When we started I knew very little about chickens; I had never even touched one. So if you are considering if you should get chickens, I wanted to help you with some background information, resources, and cost analysis first. Plus don’t miss our entire Backyard Chickens 101 series. Why we got Backyard Chickens? About a year ago we began our “real food” quest. As part of our effort to eat preservative free, non hydrogenated, high fructose free food we decided we wanted to get backyard chickens so we could enjoy delicious, nutritious, and tasty organic eggs straight from our out backyard. Sounds good right? But for this city raised girl who has never even touched a chicken I was unsure of where to start or even if I’d actually like chickens! So I started learning all I could about chickens. And now you have my Backyard Chickens 101 posts coming your way! Cost Analysis: Should you Raise Backyard Chickens? *Note feed costs can vary widely by where you live. Please check your local supplies when evaluating your costs. Locally it costs $10 for 50lb general feed and $20 for organic (soy free) feed. Now add to that the fact that if you are willing to butcher the chickens you can eat the chickens when they are no longer producing well (2 years). Here is a You Tube video on how to butcher your own chickens and a Girls Guide to Butchering. If you buy dual purpose birds they will provide you with eggs and then can supply you with chicken to eat as well. Although we’ve come to expect the tender large breasts of the 8 week old, chemical injected hen we get at the grocery store, you can still eat a chicken when it is older. The meat will be tougher (as it has actually walked during it’s life) so needs to be cooked differently – slowly and with extra moisture, but it will have more flavor and the carcass makes amazing soup! Here are great tips for cooking chickens like Grandma use to on the farm! Here is a great resource for how to cook birds at any stage and what they are called – fryer, roaster, etc. One egg contains 113 mg of Choline – a very important nutrient for the brain. Study reveals 90% of Americans may not get enough choline in their diet (12). I’ve decided I’m not going to go into the dangers of the way commercial chickens are raised (caged laying hens, antibiotics in food, and conditions for meat chickens) But if you want to read up on it just Google it and get ready to be shocked – at least I was. Backyard Chickens Lay Better Tasting Eggs! I’d heard backyard fresh eggs tasted so much better. But we buy our eggs from a local farm that delivers so I didn’t really expect much different. Boy was I wrong! The egg yolks are so much darker – more delicious & nutritious. 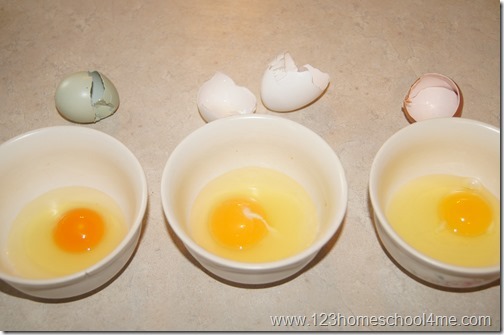 To try to show you the difference here are 3 different eggs. The blue green one is from one of our Easter Eggers we raise in our backyard. Do you see how DARK the yolk is! The white middle one is from a run of the mill commercial chicken. The one of the far right is from our local farm – tastes great, but not as great as our backyard fresh, organically raised, non-caged chickens lay! Am I Allowed to have Backyard Chickens? Sounds funny to ask if you are allowed to – aren’t we in America the land of the free? Well, yes and no. There are rules for everything these days (and more and more every month) so you need to make sure your city allows you to keep chickens. My particular city in suburbia allows me to keep chickens, but no roosters (as they are noisy and can be more aggressive). Some neighboring cities that have problems with coyotes don’t allow it unless you have a certain amount of land. Other cities allow it as long as they are caged (think large run). So before you get your heart set on chickens check out your city ordinances. After 2 years their egg production declines monthly and unless they are viewed as a pet (who can live 10+ years) they are usually culled at this point. You need space. The ideal amount of space if 4 square feet of coup per bird and 10 square feet of run per bird. So if you were to keep say 6 chickens you would need a 24 square foot coup with a 60 square foot run. There are those that have less space in their run. The down side is you may have more fighting with hens picking on each other (wouldn’t you if you were in cramped living quarters) and will need to clean more often to maintain sanitary living conditions for the health of your flock. Note: You can have a smaller run if you are free ranging your birds at least part of the time. Isn’t more better? Sure! Ideally chickens would wander around a farm and eat all the bugs and plants they like. But most of us don’t have that kind of space. Plus when chickens free range they are more likely to be eaten by a predator: dog, hawk, raccoon, or coyote to name a few. Chickens will naturally return to roost in their coop at dusk, but you need to be there to close the door or get a fancy dusk/dawn automatic doors. What is the cost of having Backyard Chickens? For Organic Chicken Food we pay $10 for a 50 lb bag that lasts us a month for our 8 hens. Scratch (especially good for the cold months when they need extra calories) – This is fun for chickens to peck at, but only use sparingly. Okay, I’m sold! Now what . . . If you know you are allowed to have chickens and have figured out where you would safely house them , now is the fun part! Pick when you want to hatch or bring home your baby chicks. When do you want them to arrive? Remember you will need to account for 21 days if you are hatching and/or 4-5 weeks of brooding where you will need to be available to care for them several times a day. Once the chicks have featured out (around 5 weeks) they are more self sufficient in a predator proof coop & run. Also consider when you want them to start laying eggs. They start laying around 20 weeks – so you will want them to start laying. Since many breeds slow down or halt in the winter months hatching eggs/chicks are unavailable or in limited supply throughout Jan/Feb. What kind of chickens do you want to raise? With so many different varieties out there it can be difficult to find the right breed for your climate and needs. We use this Breed Selector by My Pet Chicken to help us narrow down our search. We wanted cold hardy (as we live in the midwest), friendly, docile, family friendly girls that were good reliable layers. From there we picked the ones we liked to get a good mix. ORDER THEM! Coop – The other important thing you will need to get lined up is predator proof coop for them to live in….